Earth's moon — Lawyers are debating the legal link between the two worlds. Earth is notexactly getting its youth back, but a new study has determined that the collisionfrom which the Earth and moon were formed may have occurred much later thanpreviously thought, making our planet and moon younger than scientists hadcommonly believed. The Earthand the moon were created as a result of a giant collision between two planetsthe size of Mars and Venus. Until now, it was believed that the collisionoccurred when the solar system was 30 million years old ? roughly 4.5 billion yearsago. But,according to a new study that was recently published in the scientific journalEarth and Planetary Science Letters, the true age of the Earth and moon can bedetermined by examining the presence of certain radioactive elements in theEarth's mantle. 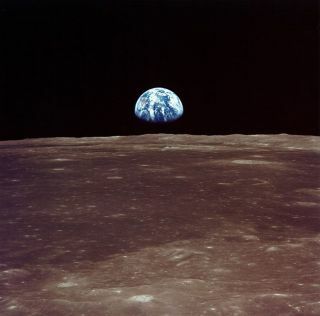 The resultsof the research show that the Earth and moon must have formed much later thanpreviously thought ? perhaps up to 150 million years after the formation of thesolar system. That makes our home planet a bit younger than scientists thought. "Wehave determined the ages of the Earth and the moon using tungsten isotopes,which can reveal whether the iron cores and their stone surfaces have beenmixed together during the collision," said Tais Dahl, who conducted theresearch as his thesis project in geophysics at the Neils Bohr Institute at theUniversity of Copenhagen, in collaboration with David Stevenson from theCalifornia Institute of Technology. The theorysurrounding the formation of theplanetsin our solar system is largely a tale of cosmic bumper cars. The planets as wesee them today were created as the result of a series of collisions betweensmall dwarf planets orbiting the newborn sun. By slamming into each other, thesmall planets melted together and formed larger planets. The last ofthese giant impact events was thought to be the one from which the moon formed,said Dahl. Theplanetary bodies that collided in this impact smashed into each other at a timewhen both had a core of metal (iron) and a surrounding mantle of silicates(rock). It isbelieved that the collision took place in less than 24 hours, and since thetemperature of the Earth was a scorching 12,600 degrees Fahrenheit (7,000degrees Celsius), it was thought that both the rock and metal melted andemulsified together in the turbulent impact. "Thebig question is: how do we date and determine the age of this event? There hasbeen a lot of discussion about that," Dahl told SPACE.com. Researcherspreviously believed that the rock and iron mixed completely during thecollision and subsequent planet formation, and it was therefore concluded thatthe moon was formed when the solar system was 30 million years old. This newstudy, however, paints a different picture. Theresearchers were able to determine the age of the Earth and moon by examiningthe presence of certain radioactive elements in the Earth's mantle. Hafnium-182is one such radioactive substance, and it decays and is converted into theisotope tungsten-182. Hafnium and tungsten have markedly different chemicalproperties, and while the tungsten isotopes prefer to bond with metal, hafniumis prone to bonding to silicates, such as rock. It takes50-60 million years for all hafnium to decay and be converted into tungsten,and during the moon-forming collision, nearly all the metal sank into theEarth's core. Yet, researchers were unsure if the tungsten had fallen into thecore as well. "Wehave studied to what degree metal and rock mix together during the planetforming collisions," Dahl said. "Using dynamic model calculations ofthe turbulent mixing of the liquid rock and iron masses we have found thattungsten isotopes from the Earth's early formation remain in the rockymantle." From thesemodels, the researchers claim that the moon-forming collision occurred afterall of the hafnium had decayed completely into tungsten. As such, the Earth andmoon must have formed much later than scientists had thought. "Ourresults show that metal core and rock are unable to emulsify in these collisions betweenplanetsthat are greater than 10 kilometers (6.2 miles) in diameter and therefore thatmost of the Earth's iron core (80-99 percent) did not remove tungsten from therocky material in the mantle during formation."